The seventh release in the series of Ambient Train Wreck back catalog releases by ambient/electronic artist Palancar. One of the many aspects of Palancar's music is live performance, both in front of live audiences and over live net radio. As part of his weekly net radio program over the past several years, Palancar has done many live improvisational ambient performances, which the artist nicknamed "Ambient Train Wrecks" - and the name has stuck ever since. Everything heard in these tracks is live and untouched, except for mastering of the recordings themselves. 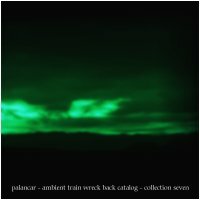 Note that Palancar has released several commercial collections of his favorite performances, under the title Ambient Train Wreck Series. Unlike those releases, the Ambient Train Wreck Back Catalog series contains the large number of train wrecks that have never been released commercially, and are only available from Earth Mantra.